After the smorgasbord of announcements from Asus, Acer and Samsung, the announcement from Dell seems a bit on the humble side. The US computer maker demonstrated an XPS 11 convertible tablet/notebook combo. It's when you dig into the specs that you realize how significant Dell's achievement is. First off, the 11.6" display has the top-notch 2560x1440 resolution, making it one of the handful of such panels, alongside tablets from Samsung and Asus. Not only that, but the system will be powered by a frugal but mighty Core i5 Haswell processor when it hits shelves in the fall. The keyboard part is pretty unorthodox, too - it has very flat keys, similar to the touch-typing experience of the Microsoft Surface covers, and if you are wondering why, it's because the Dell XPS 11's screen half can bend full 360 degree backwards, converting it into a tablet when needed, similar to the Lenovo Yoga line. 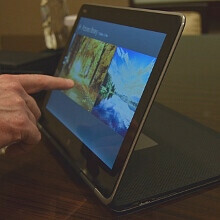 The keyboard goes off at 180 degrees, leaving you to the full Windows 8 touch experience only. There are also a pressure-sensitive stylus input for doodling, sketching and handwriting, USB 3.0 port, Thunderbolt, and the whole set weighs mere 2.5 pounds, with less than 15mm thickness, which is a commendable achievement for a carbon and metal chassis fusion. No word on RAM and storage options, as well as pricing yet, but we should know more when this thing launches near the holiday shopping craziness. I think these machines are much better than tablets! So much more things I can do with these. And you'll need a bag anyway to carry a tablet. They're still so big. Smartphone and laptop/hybrid is the best combination for work and entertainment too! Price becomes the deciding factor to most... Functionality won't be compromised of course. Now that's what I call impressive, all around. I wish it got a human-scaled price tag but it will come expensive. Hope the price will be reasonable...... ! It will be $1000+ and thats reasonable, unfortunately. Very interesting, I wonder how Apple and their current method are going to attempt to adapt and evolve along with this changing atmosphere of mobile computing in tablets and the direction they're going in. They're adopting steadily more and more desktop functionality and power.